There may be many residents of the Moncton area named "Paul LeBlanc" but only one of them has ever won an Oscar. That Paul LeBlanc, who is now retired and lives in his hometown of Dieppe, is the only known Acadian to date to ever win an Academy Award. It was earned for his work on the 1984 film Amadeus. LeBlanc had a career that can be seen as somewhat of a reassurance to locals with big dreams that such aspirations may not be as distant as you might think. The second oldest in a family of six children, Paul became interested in hair while he was in the 10th grade. After graduating, he studied to be a hairstylist at the New Brunswick Community College. Upon completion, he had a business for a few years before deciding to explore the world. "I decided I wanted to travel", he says, "so I left and, after a few stops in Montreal and Ottawa and stuff, I ended up in Toronto and got involved with wigs. This was in the late-'60s and wigs were very popular and very fashionable. Eventually, I went to Europe as a hippie, just with a knap-sack, long hair and stuff, and ended up in North Africa, and then I ended up in England. At the time, Canada was still under the common market with England so I was able to work. "Fortunately, I got to work at one of the top wig houses in the world that dealt a lot with show business, a lot with BBC (television) and movies and stuff like that. I got my first beginnings in showbiz there." After a year, he returned to Toronto and got a job at the CBC. A few years later, Paul worked on The Black Stallion (1979), his first movie credit. "The Black Stallion people came (to Toronto) and were going to shoot for a month or something and then they were leaving. They weren't going to bring any Canadians with them but I had to work with the horse. I had to put a wig on the horse every day and stuff like that. Francis Ford Coppola, who was the executive producer, came over to see the race part of the movie, which was (the ending, being shot), liked the hair work and he mentioned it to some people. They asked to meet me and I met (Coppola). Then, the next day, a producer asks me if I want to go to Italy to finish the movie. The director liked me and, because of the horse, who was the star of the movie, I got to go to Italy for nine months. "Francis Ford Coppola's a good friend of George Lucas, so when we got back to (North America), I was asked to go to the States to work for a movie for Lucasfilm called More American Graffiti (1979), which was (a sequel to American Graffiti)." The doors to Paul's film career swung open from there as he continued to land gigs on high-profile films helmed by Hollywood royalty of the late-20th Century, which included, among others, Steven Spielberg, who hired him for the Second Unit on Raiders of The Lost Ark (1981) and Indiana Jones and The Temple of Doom (1984). He was also hired to work on the third Star Wars film produced, Return of The Jedi (1983), a credit many people would be envious of having. "They had brought me in to design new looks for Princess Leia," LeBlanc explains, "because George didn't like the donut and the beagle thing (in the hair). They wanted something softer and more feminine, so I was brought in to do some drawings and designs. I did that and then they went off to England to shoot. When they came back to finish in Arizona, I joined the group there and worked with them on the end of that." "(The Jedi shoot) was very technical and very, very big. I mean there are a lot of people. There are a lot of departments, you know, and, of course, Harrison Ford's great. Everybody was very good and very nice but it's big. It's a big production. Lots and lots of people. "My sketches (related to designing Leia's hair for Return of The Jedi) are in the Smithsonian, but I had to sign them off to George Lucas. When you work for Lucasfilm, all your artwork is not yours anymore. You sign it off." Although, he was involved with that film, he wasn't involved with any of the Star Wars prequels. "I'm glad (that I wasn't involved with them). I wouldn't have been that interested even though the conceptions and designs were beautiful, especially for Natalie Portman. I love that stuff but I must say that the filming of it (was) all done in front of a blue-screen, green-screen, and stuff, and for (the hairstylists), standing by, watching, it's really, really not very interesting. Not for us. It's interesting for the director, the photographers, you know what I mean but (not) for the people doing costumes and make-up and stuff. You're standing around watching one person acting in front of a green-screen and there's nothing! There's no fun to that. It's not interesting but then when you see the movie, that's not what you see at all! Of course, it's all different but to actually be there and doing it, it's very tedious!" After the completion of The Terminal (2005), LeBlanc returned to the Moncton region and semi-retired. During that era, he opened a hair studio in Dieppe which he eventually decided to close after having a stroke and also realizing that, for him, cutting hair is not nearly as exciting as designing hairstyles for movies. He expects his last Hollywood credit to be for the upcoming film Black Swan (2010), which was shot during the Christmas months. As for advice for local people interested in having a career in the film industry, Paul recommends that they realize Moncton is far from the film industry and, not counting TV shows and documentaries, nobody can make a significant living in that field if they're based in the city. They would need to move away. "You couldn't do what I did here. It's just not possible." Paul also believes that there are behavioural differences between people living in Moncton and those who live in film centres like New York and L.A.
"People around here wait for something to happen, they don't make it happen themselves. You've got to make it (happen) yourself because nobody's going to do it for you." Since 1965, Charlottetown annually becomes a Maritime hotspot for enthusiasts of musical theatre with the appropriately titled Charlottetown Festival. From roughly May to October, people who dig such entertainment can sit back and relax to sights and sounds usually associated with Broadway in New York. The plays are usually performed for the public in the Confederation Arts Centre, an impressively large building facing the Charlottetown Mall, which was built in 1964. If you're an actor in the Maritimes, there's a good chance that you want to eventually be on the festival's payroll at some point in your career. 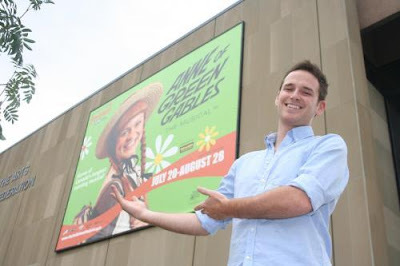 The musicals presented may have changed over the years but Anne of Green Gables - The Musical has been a mainstay on the schedule every year since the festival began. The musical's source material mostly lies in Anne of Green Gables, a 1908 novel written by Lucy Maud Montgomery (1874-1942). It was the first of nearly a dozen books written by Montgomery featuring protagonist Anne Shirley, who can be almost seen as a Canadian Pipi Longstockings. In 2008, a century after the first book was printed, another author, Budge Wilson, wrote Before Green Gables, a prequel to the original novels. Because Montgomery lived in the province and people don't usually buy souvenirs of potatoes, PEI has largely publicly adopted the character as tourism figurehead and mascot since the early 20th century. The book series was so successful that many adaptations and spin-offs in other media were made, these include (but not limited to) two theatrical films (1919 and 1934), two animated TV series (1979 and 2000), a half-dozen television miniseries, a spin-off TV series titled Road To Avonlea (1990-1996), and most importantly (in relation to the musical) a 1956 TV-movie. The 1956 TV-movie, which aired on CBC, played an important part in the development of the theatre production because it, too, was a musical. The material developed for the TV-movie was used as the foundation to what became Anne of Green Gables - The Musical in the following decade. As anyone can clearly see, with such a long and successful history attached to it, Anne of Green Gables - The Musical can be good on a CV if you're an actor. Such is the case for Quispamsis native Andrew McAllister. It's the second year that the 24-year-old, who now calls Toronto home, has been performing in the production. Last year, McAllister played the role of "Charlie Sloane" in the ensemble. This year, however, he's been promoted to "Gilbert Blythe," Anne's love interest and, in some sequences, antagonist. "(It's) fantastic to play an icon role, like Anne or Gilbert. I feel that it could really be a defining credit on your resume, so I feel like this is my chance to maybe be looked at in the eyes of a casting director more seriously or taken more seriously and get better opportunities," he said. McAllister's story proves that it's possible for New Brunswickers to succeed in show business if they're willing to work for it. After finishing high school in 2003, McAllister enrolled in Sheraton College, where he graduated in 2007. Although it's usually recommended for actors to join a union, which he eventually did, he consciously didn't for a while so that he could gain additional experience by playing non-union roles. "I did a cruise ship right after I graduated just to get some money and get some experience. Then I was finding that I had a few job opportunities to become (a union member) but I didn't take them because I figured that, once I'm just out of school, I want to build a name for myself and maybe do shows that I may not get to do if I was a (Canadian Actors Equity Union) member because," he said. "The thing is that if you're non-Equity there's a lot more opportunities, really. Once you join a union, there are only so many union spots and there are so many people who are "union" and if I'm 21 years old and I'm already a member... I just find that I see so many people that just struggle to get work. So, I wanted to do as many shows as I could so I did about 10 shows as non-union then the right things happened at the right time. Now I'm working as a union member. "I've been a member of the Canadian Actors Equity Union for a few years. It's nice to know that (the Charlottetown Festival) mainly hires Equity members. I find the standards great, whether you're Equity or non-Equity but I find it adds a sense of professionalism and you know that you're well taken care of and, if you have injuries or what not, you'll be in good hands." Another advantage for him associated to his gig at the Charlottetown Festival is the proximity its location is to his friends and family from the Saint John area. "I'm very close to home! It's only like three hours away. It's just so refreshing that my friends and family can come see me in shows. Some of them haven't seen me in anything since high school. To be known as a working actor from Quispamsis, sometimes people don't really get what that entails and the hard work. They just think it's like you're singing and dancing and whatnot. It takes a lot of effort." He said he has also had good support from his family. "They understand that you can fall on hard times or you could be successful. I mean I've made a good living for myself since I graduated from college and I've continued to work, so I mean they're supportive in that but I think they also realize that if I were to be trying to survive in this industry and I was 30 years old and I still wasn't a member of a union or working that consistently, then they would probably say maybe it's time to think about teaching or doing some other form of being in the same industry but just (doing) something that's more certain." Although he knew of its title character because he grew up in a province neighboring P.E.I., McAllister didn't know the story of "Anne of Green Gables" before joining the production. "I've never read the book, I've never seen the miniseries and I live in New Brunswick. Obviously when you audition for a show you want to research it and you want to understand what it's all about," he said. "I didn't know a lot (about Anne of Green Gables) before I came but now, since I've been here for two summers, I feel like the 'World of Anne' is special. People would be doing themselves a disservice by not seeing (the production). Now, I feel like I missed-out growing up (without knowing the story or seeing the production)." If anyone ever spots McAllister in public, they shouldn't hesitate to ask him for an autograph. In fact, people are invited to ask him. "(If they ask for autographs), it means I'm doing my job!" Anne of Green Gables - The Musical runs until Aug. 28 with showings at 2 and 7:30 p.m. at the Homburg Theatre. Tickets cost between $39.10 and $75 and there are also family packages available. To order tickets, visit www.charlottetownfestival.com or call 1-800-565-0278. Some people say that certain things never go out of fashion. If that saying is a reference to Baroque music, it's entirely accurate in the eyes of many people, proof of which can be seen with the Lamèque International Baroque Music Festival. Established and incorporated in 1976, the festival has been bringing the world of Baroque and Classical music to the tiny northern community of Lamèque. The festival's 35th edition takes place tomorrow through Sunday. For enthusiasts and academics, the history of music is filled with labels and classifications based on style and when any piece of music was written. Many of them overlap each other. As an example, musically speaking, we are currently in the Contemporary period, which began in 1975, and the 21st Century period. Based on its definition, Baroque covers all music (but mostly pieces originating in Europe) written between 1600 and 1760. The Classical music period began in 1730 and ended in 1820. Since both periods existed at the same time for 31 years, the Lamèque festival also includes classical and, to a lesser degree, the Romantic period (1815-1910) which had a similar but smaller co-existing situation with Classical. According to Montreal resident Mathieu Lussier, a bassoon player and the festival's artistic director, such strict parameters inspire creativity in modern players, composers, and the festival in general. "No one will write new Baroque stuff but we can write in the style of Baroque music," he says. To stay true to the Baroque period, all musicians performing at the festival will play either original instruments used during that period or modern reproductions. "In Lamèque, as with many other Baroque festivals around the world, we play that music with the instruments that they were using at the time," Mathieu says, "using original instruments or copies. For instance, my bassoon, instead of the big modern shiny metal bassoon with like 28 silver keys, is made out of soft wood with only five keys! "The violins (used at the festival), instead of big loud with metal strings that can play huge halls, have gut strings made of animal guts. So, it's a totally different sound. It's more demanding in a way because the instruments (then) were are not as refined with their sound as they are now but we're recreating the sounds of the orchestra of the time. That's the exciting thing about the festival!" Mathieu has been heavily involved with the music scene since he was 16 when a high school instructor helped him land his first gig as a performer. He considers the early-1990s as the period when he became a professional. Since that time, he has performed on approximately 50 albums. His experience as a performer eventually led him to the Lamèque festival in 2000. He continued to perform there each year. Eventually, he became its artistic director. Ever since his first performance, he has been blown away by the atmosphere and lack of separation between the performers and the audience. It encourages fans to communicate and meet with the artists between performances. "It's extremely open and that's what musicians like about Lamèque - the human experience," Mathieu says. "It's so different than the usual festivals. (Usually,) you're invited somewhere. You arrive at the airport, there's a driver that brings you to a hotel. Then, you go to a concert hall, play a concert and maybe sign a few CDs, then go back to the hotel and then leave! "The artists are going to stay for a full week in Lamèque in a bed and breakfast or staying at someone's house. They're going to meet people. It's a unique culture and landscape. We all share the meals. There's a group of women who will be cooking the meals for all of the artists. It's so much more fulfilling (than the usual performances). It's not a gig. It's something special." Among the artists performing at the festival this year, there will be two performers who have been creating a buzz in recent years: Croatian mezzo-soprano Renata Pokupic and French organist Benjamin Alard. Mathieu encourages anyone to attend the performances. "You don't need any type of background to enjoy Baroque music!" All performances at the Lamèque International Baroque Music Festival will occur at Sainte-Cécile Church in Petite-Rivière-de-l'île, near Lamèque.